Reducing antibiotics use is part of plans to combat drug-resistant diseases. The UK’s Department for Environment, Food and Rural Affairs (DEFRA) recorded record low sales of antibiotics for use in livestock last year and more ambitious targets are on the way. According to a new government report to be published this Friday, sales of veterinary antibiotics relative to the UK’s food-producing animal population dropped by 27% between 2014 and 2016. While there were 62mg of antibiotics sold per kg of livestock biomass in 2014, this fell to 45mg/kg last year. According to DEFRA, this surpasses the 50mg/kg target set for the industry. The industry group Responsible Use of Medicines in Agriculture (RUMA) is expected to announce new targets later on Friday to reduce antibiotics use in the future. Efforts to reduce antibiotics use in humans and animals are part of a plan to tackle anti-microbial resistance and avoid the emergence of drug-resistant superbugs. The latest EU-wide comparison of antibiotics use is for 2014 and shows the UK to be among the most moderate users, with less than half the European average rate. “The dairy industry needs to prepare for radical change; with more volatility, less support and greater competition as a result of Brexit, according to a Dairy Hub panel at AgriScot. More collaboration is needed across the dairy chain, the dairy hub panel at AgriScot agreed on Wednesday. She added that we have grown accustomed to volatility over the last decade, but that the peaks and troughs are more amplified now. Swings of 10p/l to 12p/l are the norm, compared to just 3p/l a few years ago. Cerebrocortical necrosis (CCN) – a nervous disease in cattle and sheep caused by disrupted thiamine production in the body. One evening recently, a client phoned saying he had a bullock that was on grass and behaving very unusually. He was falling on the ground and paddling, trying to get up but on getting his legs under him failing to rise and ending up in a dog-sitting position with his head held high and shaking. The animal was about 550kg and was on the farm about a month and was on a field of lush grass. The symptoms were definitely those of a brain problem. At this stage, the diagnosis is a process of elimination as the following conditions come to mind: meningitis, listeriosis, lead poisoning, injury, tetany (very rare in male cattle), and cerebrocortical necrosis or CCN. In the case of meningitis, one would expect a more gradual onset and probably an elevated temperature; listeriosis would likely have the animal walking in circles, again with an elevated temperature, and would not have come on as suddenly. Lead poisoning will come on very suddenly if the animal had access to lead (in batteries, old painted gates or old horse carts, etc.) This was unlikely, given that this field is in pasture a long time and not near a public road from which hazardous material could have been thrown. The most likely diagnosis was CCN. The animal was treated for this and while his prospects at the time looked poor, he had made an excellent recovery by the next morning. Ruminants have working rumen bacteria that synthesise thiamine for the body. However, feed concentrates given to ruminants are often heavily stocked with thiaminases, which counter its production. High levels of sugars in feed can also result in thiamine inadequacy. When there is a sudden increase of glucose in the body, thiamine will be depleted so that it is not available, resulting in induced deficiency. High concentrations of sulphur intake has also been deemed responsible for CCN. Sulphur is necessary for the synthesis of important sulphur-containing amino acids and proteins. Luscious grass high in sugars and sulphates are seen as a likely predisposing factor to CCN. Immediate treatment is absolutely necessary to prevent death. The only advice one can give in seeking to prevent it is to make sure there is enough fibre in the diet. Outlined are 10 steps which can help you to make finishing cattle a more profitable operation for your farm business. 1 Budget: before you decide to finish cattle, you should carry out a few simple sums to see what costs are going to be involved in bringing the animal through to point of slaughter. Always use costs and a beef price that is reflective of your typical farm inputs and cattle type. If you have R grading cattle, then use a price that reflects this. Using an unrealistic price will make the exercise pointless. The budget can also help to indicate what you can afford to pay for store cattle in the mart and, in some cases, it may direct you to changing from buying U grade animals to R and O+ types. 2 Know your market: to get the best possible price for your cattle, you should be focused on delivering carcases that meet market specification on weight and conformation. For example, processors have fewer market options for bulls that are over 16 months, or carcase weights in excess of 420kg. Having cattle that are consistently finished to market spec can be an advantage at times when processors are well-supplied with cattle, as you may avoid a delay in getting animals slaughtered. 3 Monitor weight gain: weighing cattle will give you a sound base to work from at the start of the finishing period. Use this weight as part of your finishing budget as it will improve the accuracy of your finishing costs and break even prices. This will help you to make a more informed decision. Once you have started to intensively feed cattle, weigh them approximately every 30 days to monitor daily liveweight gain, and also as an indicator of when the animals might be ready for slaughter. When weighing, bring cattle out of the pens in their group and weigh one pen at a time, to help keep stress to a minimum. 4 Monitor feed costs: knowing the daily weight gain in finishing cattle allows you to work out the margin the animal is generating, in terms of carcase value, every day it is on farm. From this, you can calculate the margin over feed costs. For instance, a steer gaining 1kg/day of liveweight will be gaining 0.55kg/day of carcase at 55% kill-out. At a beef price of £3.60/kg, the animal is generating £1.98 every day during the feeding period. But, assuming the steer is eating 20kg of silage (£25/t) and 7kg of meal (£210/t), it has a daily feed cost of £1.97/day. Therefore, the animal is just covering feeds costs at the outlined weight gain and beef price. Fixed costs are excluded from this. Once the animal is at a suitable fat cover, you should market without delay as there is no economic advantage in holding it to reach a heavier carcase weight. 5 Group cattle to size and finish date: once weighed, group cattle according to liveweight and target sale date. This will cut down on the amount of bullying, or aggressive behaviour in the pen. Grouping animals based on size or kill date will allow you to sell them as a group. You do not want to be drafting animals from several pens this winter, and then regrouping the remaining animals, as this can lead to increased aggression among cattle, especially bulls. 6 Housing space: when cattle are finished indoors, make sure they have adequate lying space. Remember that space allowance will decrease as animals get heavier. 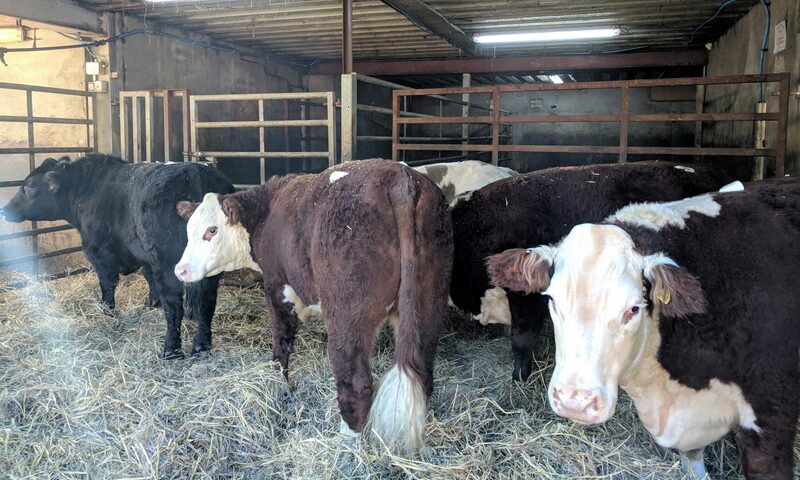 For instance, for a group of eight bulls weighing 550kg at housing, and at a daily weight gain of 1.5kg/day, there will be an extra 84kg of liveweight in the pen each week. After seven weeks, there is the equivalent of an extra animal in the pen. Over 100 days, the weight gained is the equivalent of adding an extra two animals to the group, which means animals can be overstocked without you realising. This will have a negative impact on performance. Therefore, always pen animals based on finishing weight to make sure they have adequate lying space. 7 Animal health: finishing cattle perform best when they are in good health and free of parasites. Make sure animals have been properly wormed before they start the intensive feeding period. Also, given the wet second half of the year, fluke could be a concern this winter. Animals should either be dosed using a suitable product, or dung samples taken to determine infection status. If cattle are bought in, isolate from the main herd for a period of 10 to 14 days. This will allow animals time to settle and show symptoms of any respiratory problems arising from the stress of moving onto a new farm. Using an IBR vaccine is advisable on farms where cattle are regularly bought in for finishing, and on suckler to beef units with a history of respiratory issues. Keep a close eye on the withdrawal dates for any treatments given to cattle. 8 Keep finishing diet simple: finishing diets should be kept simple. Rations should be high in energy, and lower in protein, than general-purpose beef mixes. Whether you purchase rations, or mix your own feed, energy levels should be a minimum of 12.5 ME. Protein levels should be kept to around 13%, if you want to get animals to an adequate fat cover, especially bulls. Key ingredients include barley and maize, along with a limited protein source such as soya or distillers. Straights that are high in digestible fibre, eg soya hulls or sugar beet pulp, can also be added. When moving cattle from the growing ration to the finishing ration, do so gradually. Increase the levels of the finishing ration offered to animals over the course of one week to 10 days. When offering more than 4kg or 5kg of concentrate, it is advisable to split into two feeds. If building up to ad-lib feed levels, do so over a period of 10 to 14 days to avoid any potential issues with acidosis. 9 Set a limit to the finishing period: There is little performance benefit in intensively feeding continental steers beyond 100 days. For early maturing traditional beef breeds, this feeding period can be reduced to 80 days. Heifers will mature earlier than steers, so limit the feeding period to 50 to 80 days depending on breed type. Bulls can be fed for 150 to 200 days on an intensive finishing diet and still give high levels of performance and remain lean. Therefore, it is important that you are feeding continental animals the correct ration so that they have adequate fat cover when slaughtered. 10 Sell cattle in batches: cattle should be sold once they meet the required level of fat cover and finishing weight. Holding animals beyond this point will offer no real economic benefit as the larger an animal gets, the less efficient it becomes at converting feed to lean muscle. There is also the risk of cattle falling out of market spec, which devalues the sale price. If cattle have been correctly grouped for finishing at housing, they can be sold in batches which will help you to negotiate on price when talking to your meat processor. It is such a good meal and so easy to make. I love that Thai influence on our cooking. Instead of pork this would also work well with minced turkey, or chicken, or beef. You could make it with a simple tomato sauce but I love the curry taste.The pork with apple and cider is my take on the popular combination of pork and apple sauce. I like the breadcrumbs on top and you could add oats or nuts if you want more texture. The shoulder is a delicious cut and good value. Your butcher will trim and dice it for you. You could, if you like, use pork chops but if you do take care as they will cook faster. I like this with cider but I do notice the huge increase in Irish craft beers around the country and one of them would be well worth trying. Heat the oven to Gas Mark 7, 220°C (425°F). Put the mince, onion, egg, breadcrumbs, chilli, garam masala, half the ginger and half the coriander in a bowl. Season with a little salt and black pepper. Mix well then shape into 18 even sized balls approximately 4cm in diameter. Put the meatballs in a large roasting tin and drizzle over the oil. Toss gently. Place in the oven and cook until golden, about 15 minutes. While the meatballs are cooking make the sauce. Heat a frying pan and add the curry paste and remaining ginger. Cook for a minutes, stirring all the time. Then add the tomatoes and continue to cook for 2-3 minutes. Add the coconut milk and bring to the boil. Reduce the heat and leave to simmer for 5 minutes. Pour the sauce over the meatballs, mix well. Return them to the oven and cook for another 20 minutes. Just before serving stir in the lemon juice and scatter over the remaining coriander and the almonds. Serve 3 meatballs per serving with steamed rice. The Brexit referendum is taking its toll on the veterinary industry, with one in five saying that recruitment is harder. The British Veterinary Association (BVA) is concerned about the recruitment and retention of staff post-Brexit. They told the UK Migration Advisory Committee this week that if there are no appropriate immigration measures put in place then a large gap in the 23,000-strong veterinary workforce will appear. BVA research indicates about one fifth of vets are already finding vet recruitment harder. Over half of vets registering in the UK each year come from overseas, mostly the EU. The Royal College of Veterinary Surgeons has commissioned research which shows nearly a third of EU vets and vet nurses are considering moving back home. The Migratory Committee also heard that all 128,000 EU nationals working in Scotland contribute an average of £34,400 each to gross domestic product, according to the Scottish Government. Separately, the Federation of Veterinarians of Europe (FVE)has called on Brexit negotiators not to jeopardise current high levels of animal health and welfare. and animal welfare require an international approach,” FVE president Rafael Laguens said. For every animal or animal product that is imported or exported, specially trained official veterinarians must certify and supervise the process to and from third countries, facilitating smooth trade. The plea calls for the EU and UK to commit to a single standard that will help avoid confusion and the opportunity for fraud. The group also called for continued EU-wide mutual recognition of veterinary degrees, given the mobility of the profession across Europe. Clipping hair off the back of cattle can help reduce animals overheating in sheds, especially in weanlings or intensively fed cattle, as it helps to keep animals cooler and reduces heat stress in a heavily stocked shed. When clipping cattle, the more hair removed from the animal’s back, the better. Taking at least three runs either side of the spine will help to reduce sweating when housed. Trimming the tail may also help to keep cattle cleaner. Clipping will also help reduce the incidence of lice on cattle. On some farms, a lice treatment will be needed later on during the housing period. 1 Preheat the oven to 170oC, (325F/gas mark 3). Heat half of the butter and oil in a large frying pan. Add the shallots and fry until they are just beginning to brown, then tip in the pancetta and fry until lightly browned. Transfer to a plate with a slotted spoon. 2 Place the beef pieces in a polythene bag with the seasoned flour. Shake until well coated, then remove, shaking off any excess. Add to the frying pan and fry until lightly golden on all sides. Transfer to a casserole dish with a lid. 3 Add a little of the red wine to the frying pan and, scraping the bottom to remove any sediment, pour in on top of the beef with the rest of the red wine, the stock, carrots, celery, bay leaves and thyme. Add the sautéed shallots and pancetta and season to taste. Stir to combine, then cover and place in the oven for two hours or until the meat is tender but still holding its shape. 4 Halfway through cooking, heat the remaining oil and butter in a large pan and cook the mushrooms until just tender and lightly browned, stirring. Add the brandy and cook for another few minutes, then stir into the casserole dish and return to the oven for the remaining cooking time. Remove from the oven and leave to cool and settle. 5 Meanwhile, cook the potatoes in a pan of boiling salted water for 10 minutes, then drain and leave until cool enough to handle. Cut into 1cm (½in) slices and arrange a nice overlapping layer on top of the stew. Brush with the melted butter and season lightly with salt and pepper. other few minutes, then stir into the casserole dish and return to the oven for the remaining cooking time. Remove from the oven and leave to cool and settle. The World Health Organization has recommended that farmers and those involved in the production of food stop using antibiotics to promote growth and prevent disease in healthy animals. The recommendations are part of new guidelines from the WHO on what constitutes inappropriate use of antibiotics in the food chain, with the aim of tackling one of the main causes of antimicrobial resistance. The organisation says overuse and misuse of antibiotics in animals and humans is contributing to the rising threat of antibiotic resistance. According to the WHO, in some countries around 80% of the total consumption of medically-important antibiotics happens in the animal sector and largely this is for growth promotion in healthy animals. Overall the WHO strongly recommends an overall reduction in the use of all classes of medically-important antibiotics in food-producing animals. It says this should include a restriction of the use of these antibiotics for growth promotion and disease prevention, unless diagnosis has been made. The WHO says healthy animals should only receive antibiotics to prevent disease if it has been diagnosed in other animals in the same flock, herd or fish population. It also calls for antibiotics that are being used on farm animals to be selected from a list that it deems to be of lowest importance to human health. Antibiotics that are considered to be in the last line of defence for humans should not be used at all it says. It recommends that where possible animals should be tested to determine the most appropriate form of medicine for their illness. “Scientific evidence demonstrates that overuse of antibiotics in animals can contribute to the emergence of antibiotic resistance,” says Dr Kazuaki Miyagishima, Director of the Department of Food Safety and Zoonoses at WHO. Research published in The Lancet Planetary Health found that when antibiotic use in food-producing animals is restricted then antibiotic-resistant bacteria in these animals fell by up to 39%. The EU has already banned the use of antibiotics for growth promotion, but these new recommendations from the WHO go further. Reacting to the news the Farmer groups said it was critically important that decisions are strongly supported by factual evidence. It said prolonging the effectiveness of antibiotics for humans and animals is a key objective for everyone and requires a multi-faceted fact-based long-term approach. The use of antibiotics on farms is already heavily regulated, with all products available only under veterinary prescription to farmers. Retailers also have a huge role to play in ensuring their tactics are not forcing producers to produce food at prices below the cost of production. The UK Export Certification Partnership has published the health certificate authorising shipments of British beef to the promising Filipino market. The certificate is valid for chilled of frozen beef from cattle of any age, born and raised in the UK, and covers carcase parts only – excluding offal and processed fats. The document was expected since a formal agreement was announced in August, allowing British beef into the country for the first time since the 1996 BSE crisis. Individual factories must obtain an import permit from the Filipino authorities before shipping products. The Philippines’ 100m-strong population offers a promising market, with modern supermarkets gaining an increasing foothold in a country that until recently was served mostly by backyard butchery operations. A relatively low 10% tariff applies to beef imports. The UK beef industry estimates that exports to the Philippines will be worth £34m in the next five years. In its latest beef outlook report, the AHDB noted “strong international demand for forequarters and other cheaper cuts, especially from the Philippines,” with a positive impact on prices, but added that this had not benefited UK export volumes overall. Direct access to the Filipino market is likely to help British exports here. Beef from the Republic of Ireland has been successful in the Philippines, with more than 10,000t exported in the first half of this year – more than double the shipments recorded during the same period last year. There was 20 times more Irish beef exported to the Philippines than to the US in the first four months of this year.